Many times when a watch lands with watchmaker, one of the first things they do is to put the watch on a timing machine. Timing machines measure one aspect of the watch’s health by measuring the balance wheel’s function, its amplitude, and how well the watch measures accurate time. Timing machines live with the watchmaker, are hard to find, and they are expensive. Jon Edwards, both a computer programmer and watchmaker, just updated Kello, an iOS app that runs on both iPads and iPhones that utilizes Apple’s included headphone/microphone combination as the sound pickup. Timing machines utilize a microphone and listen for the mechanical beats of the pallet fork hitting the impulse wheel. Knowing the lift angle of the pallet fork (typically 52 degrees), and the beats that the watch is intended to run (typically 28,000 beats per minute), the timing machine shows on an oscilloscope-like display the beats and whether the balance is “in-beat” and runs either fast or slow, amplitude (how widely the balance swings to-fro), and is consistent in five positions (watch face up, watch face down, crown up, crown down, crown left/right). Kello, Finnish for clock, utilizes the iOS’ devices built in sound processing features and displays the watch balance’s performance on screen. Unlike a Witschi watch timing machine, Kello is as portable as the iPhone and much less expensive. 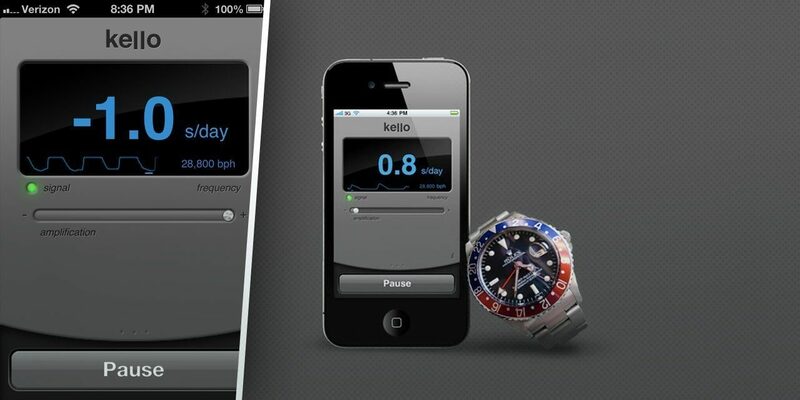 Kello can easily travel to vintage watch stores or shows and can provide a quick check on the watch’s health. Using the software is as straightforward as any iPhone app. The user holds the earbud microphone onto the watch, adjust the listening sensitive via a slidebar, and the app listens for the watch’s beat and calculates its rate. 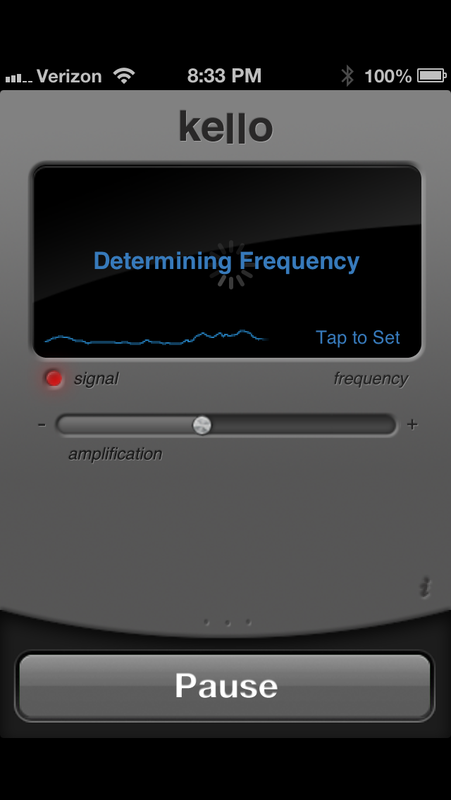 There is a progress indicator signaling progress towards a measurable signal from the watch. The Beats per Minute (BPM) and angle of lift are adjusted automatically, but can be set manually if the user knows what they should be. Positioning the microphone does take a little practice, and it works the best in a room that has little ambient noise, and on a table that allows the microphone to sit on the watch undisturbed. Although not as accurate as a Witchi timing machine, it does make for an easy watch timing device that is portable to any watch shop or watch show and makes a great conversation piece.